If you are not familiar with ES Waves please check out the ‘Nakatomi Plaza’ album released on the defunct Inaspace Recordings label in 2006. Despite the label’s demise you can still buy the album from various digital stockists and it can also be heard via Spotify. Also in 2006 the then progressive dj Jonathan Lisle asked ES Waves to help out on his OS_0.2 mix album released on John Digweed&apos;s Bedrock Records label. There is some new ES Waves material in the works which comprises some club tracks and the second full length ES Waves album &apos;Parasol Stars&apos;. 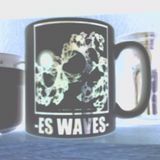 To contact ES Waves please email &apos;info [at] eswaves.com&apos; replacing the &apos;[at]&apos; with &apos;@&apos;.